Anger Mode is the first book in a trilogy from Swedish author Stefan Tegenfalk. The book opens with a section from 2004 in which a horrible car accident kills two adults and a ten-year-old girl. The timeline then switches to and remains in 2009. A series of murders takes place in which the killer (a different person each time) in an inexplicable fit of anger murders someone close to them both physically and often emotionally. The killer then has no memory of the incident. These unusual cases reach the desk of experienced and maverick Stockholm County Detective Inspector Walter Grohn. Called in to assist him from a new special investigations unit, RSU, is Jonna de Brugge a young analyst who has been through the police academy. They make some progress on the case but then several things happen. Walter is rushed into hospital and subsequently suspended from his job and the Swedish Security Service SAPO take over the case. SAPO's investigations take a different tack altogether and leads them to a group of so-called Muslim extremists. The book then switches between SAPO investigator Martin Borg and his illegal attempts to show the world what the Muslims are up to (in his eyes) and Walter and Jonna and their attempts to find the common link between the deaths. Both narrative streams are linked (and eventually collide) by the actions and presence of amoral journalist Jorgen Blad who's been blackmailing a source in the police department. Though the underlying whodunnit and why can be quite easily deduced by the police they are hamstrung by legality and have to resort to underhand methods to get the information they need to make the deduction. The inclusion of the SAPO storyline lengthens the book and I presume is necessary for the continuing bigger story, which is more than just a police investigation. "At first glance, the man did not seem to present much of a threat. Even so, Tor was on his guard when he bent over him to see how hard he had taken the blow. He had read the Lisbeth Salander novels and knew not to judge a book by his cover. If a thin anorexic could floor a blond giant, then this little fatso could take Tor, despite the fact that he was over two metres tall and had been a hardened criminal for thirty-five years." 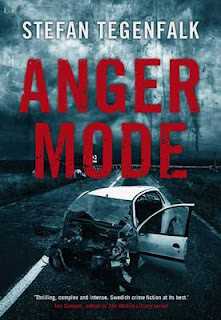 In conclusion Anger Mode is very readable, though perhaps slightly too long and I personally could have lived without the SAPO storyline but I'll be able to judge that storyline better when I've read the remaining two books. The second part, Project Nirvana, is published 12 July 2012. If you have a Kindle (UK) then snap this one up for 85p (at the moment). Excellent review. I loved all the humorous little touches (eg Lisbeth S as you quote and the previously unmentioned triplet!). Like you I think the strongest elements were Walter/Joanna as characters, and their dynamics. The "wonder drug" storyline and the SAPO subplot were both weaker elements in my view. But the author has a lovely writing style & I, too, am looking forward to the second one - which is only £2 something on pre-order at Amazon (print edition).